WebcamMax 7.8.7.8 - Download Win Apps. 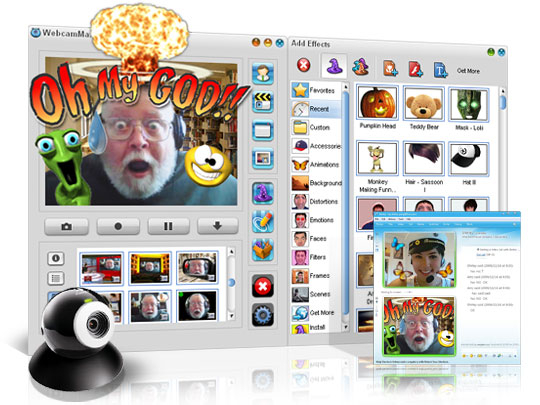 Add thousands of cool effects to webcam video for live video chats or recording..
WecamMax enables you to add thousands of effects or doodling to webcam video for live video chats or streaming. It supports almost all popular webcam programs, such as Windows Live Messenger, Skype, Yahoo Messenger, Youtube, and Ustream. You can take snapshots or videos with it and directly share them on facebook or Youtube. As a virtual webcam, it also enables you to show videos, photos, desktop screen or even multiple webcam videos to others. In comparison to WebcamMax installs itself as a webcam on your PC and broadcasts a video. Use it with any application including Yahoo, Skype, Window Live/MSN, Gtalk, Camfrog, AIM. Also works with web apps like Justin. tv, iVideoChat, LiveVideo, UStream. tv etc. Streams/plays videos and movies on Yahoo, MSN, Skype, Chatroulette, AOL, Paltalk, ICQ, Camfrog, YouTube and on all messengers instead of actual Webcam. It streams videos and movies on your messenger just like a webcam.